As Jim Murphy (’67) recalled it, an invitation from the Office of Development led five members of the class of 1967 (Jim Davis, Barry Grenier, John Kromer, Jim Murphy and Mike Reidy) to hold a conference call in 2012 to discuss ideas for their upcoming 45th class reunion. The tradition of a class gift to the College came up during the call, Murphy said. The group had wanted to find a way to pay tribute to classmate Fr. Ev Hemann, who had recently passed away, which ultimately led the group to recommend establishing the Class of 1967 Faith and Nation Service Scholarship to honor class members who gave service to the Catholic faith and/or to the country through military service. A plaque also would be engraved and installed recognizing these individuals, and include a listing of all classmates who donated to the fund. An annual scholarship would be awarded to one student of each of the four Loras classes, for demonstrated service to faith, country or community. The scholarship fund has four goals, according to Murphy: to honor the class of 1967 alumni who live (or have lived) a life dedicated to religious or military service; to recognize and support Loras students who demonstrate that same dedication in their personal life; to achieve a fund gift total in excess of $200,000 in cash and pledges by their 50th class reunion in October 2017; to have 115 or more 1967 alumni participate in contributing to the scholarship fund. “This scholarship honors and thanks some special ’67 alums for what they did in their lives and extends that recognition and appreciation to similarly deserving Loras students now and in the future,” said Murphy. To date, the Class of 1967 Faith and Service Scholarship Fund Committee has grown to 30 members, and has raised $170,000. The committee would like to see the fund increase substantially beyond the $200,000 goal in coming years. One anonymous member of the class has committed $5,000 to the fund when 115 members (or 50 percent) of the class are recorded as contributors to the scholarship. Of the 230 current 1967 graduates, 113 have donated. The fund has provided $1,000 awards to 10 students since the 2012-2013 academic year and hopes to increase the amount of the individual awards in the future. “We’re grateful to our fellow classmates that have generously contributed to this class scholarship. We’re hopeful that the giving spirit continues, especially in 2017 when we celebrate our 50th college graduation anniversary,” said Reidy. To other classes considering starting a scholarship, Reidy offered these words of encouragement, “We certainly hope and encourage other Loras College class years to organize and develop personal and meaningful ways for their class to give to Loras College. 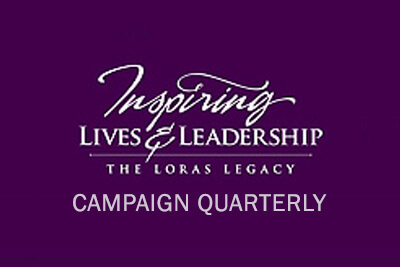 It feels good to do so and it is the right thing to do.” To make your gift or pledge to the Class of 1967 Faith and Nation Service Scholarship, contact Amy Bess, senior development officer, at 563.588.7969 or by email at amy.bess@loras.edu.